A Russian Soyuz ferry craft glided to a smooth linkup with the International Space Station early Thursday, bringing three fresh crew members to the lab complex and clearing the way for launch of a new commercial cargo ship Saturday, a critical test flight intended to pave the way for post-shuttle U.S. resupply missions. With veteran cosmonaut Gennady Padalka monitoring an automated approach, assisted by flight engineer Sergei Revin and NASA astronaut Joseph Acaba, the Soyuz TMA-04M spacecraft's docking system engaged its counterpart in the station's upper Poisk module at 12:36 a.m. EDT (GMT-4), two days after launch from the Baikonur Cosmodrome in Kazakhstan. "It's gorgeous, just beautiful," Padalka, making his third trip to the space station, marveled as the Soyuz closed the final few feet. "Gennady, you have to have ice running through your veins," a Russian flight controller radioed. Standing by to welcome the Soyuz fliers aboard -- and to wish Acaba a happy 45th birthday -- were Expedition 31 commander Oleg Kononenko, European Space Agency astronaut Andre Kuipers and NASA flight engineer Donald Pettit, who have had the station to themselves since three other crew members departed April 27. A few minutes after docking, Revin told Russian space agency director Vladimir Popovkin that the two-day flight to the station went smoothly, saying "we ate well, we worked well, the water quality was excellent, so everything's nominal, the vehicle behaved extremely well." "OK, well the most important words I heard was that you ate well," Popovkin joked. "So that means you're feeling OK?" "Yeah, we're doing very well, (it's) great to be on the station and we're very happy to be reuniting with our crewmates." The Soyuz arrival kicks off a busy few weeks aboard the station, starting with the planned launching early Saturday of a Falcon 9 rocket carrying an unmanned Dragon cargo ship, both built by Space Exploration Technologies Corp. of Hawthorne, Calif.
SpaceX holds a $1.6 billion contract to build and launch at least 12 cargo delivery flights to the space station in a commercial venture intended to help keep the station supplied in the awake of the shuttle's retirement. The test flight is being carried out under a separate $396 million contract that included a 2010 Falcon 9/Dragon test flight that did not go to the space station. Assuming an on-time launch Saturday from the Cape Canaveral Air Force Station -- and successful tests of its navigation and abort systems during a close-approach Monday -- the Dragon capsule should be ready for capture by the station's robot arm early Tuesday. Pettit and Kuipers, operating the Canadian space crane and the station's U.S. docking system, plan to attach the Dragon to the Earth-facing port of the forward Harmony module to complete the rendezvous and berthing sequence. Hatches between Harmony and the Dragon capsule will be opened Wednesday, clearing the way for the crew to begin unloading 1,150 pounds of food, clothing and other supplies. If all goes well, the capsule, loaded with trash and no-longer-needed equipment, will be detached by the arm on May 31, setting the stage for an automated re-entry and splashdown off the coast of California. The next day, Kononenko, Pettit and Kuipers plan to return to Earth aboard their Soyuz TMA-03M spacecraft, landing in Kazakhstan to close out a 193-day mission. Padalka, Revin and Acaba, the core members of the Expedition 32 crew, will have the station to themselves until July 17 when three fresh crew members -- cosmonaut Yuri Malenchenko, NASA astronaut Sunita Williams and Japanese astronaut Akihiko Hoshide -- arrive aboard the Soyuz TMA-05M spacecraft. 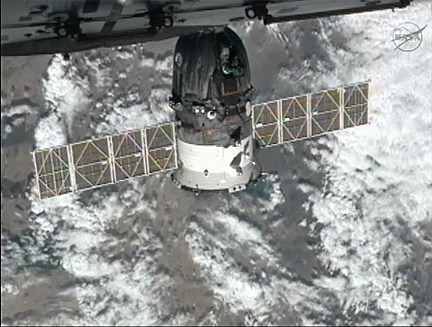 Ten days later, a Japanese cargo ship will arrive at the station. After capture by the station's robot arm, the HTV-3 spacecraft will be berthed at the same Earth-facing port as the Dragon capsule. The HTV berthing will be followed by arrival of a Russian Progress supply ship, scheduled for docking Aug. 2. Padalka, Revin and Acaba are scheduled to return to Earth Sept. 17 to wrap up a 125-day stay in space.